A lot of companies develop their own mobile apps, applications related to transactions like mobile banking to ensure confidentiality and integrity to the user for their data. Cigniti uses the Mobile OWASP Top 10 as a guideline for testing. Cigniti assures security of your mobile applications that are installed on mobile devices by performing in-depth security testing on all major platforms – iOS, Android, Blackberry, & Windows Mobile. We also specialize in reverse engineering and source code reviews of mobile apps. Cigniti delivers a variety of reports to verify your application security posture and provide actionable intelligence to help you quickly prioritize and remediate any exposures. 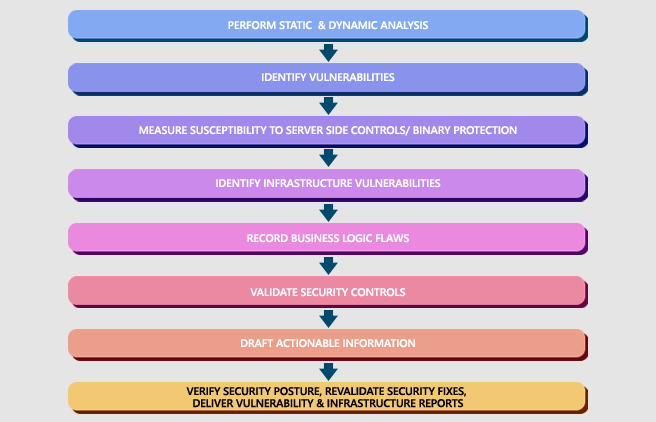 Mobile Application Vulnerability Report: Explains how your applications can be exploited via weak server-side controls, client side injection, insufficient transport layer security, unintended data leakage and other threats, and provides valuable information for code fixes. Infrastructure Findings Report: Provides details about the application infrastructure such as operating systems, framework used, back-end database etc. with appropriate recommendations.